A symbol of secrets, poison, and death, Huck Gee’s Skullhead is fossilized in smooth glossy fiberglass and blown up to mega proportions, measuring 48 inches tall. Admire it as an all white modern masterpiece or have Huck customize it to be an original objet d’art. Limited edition. Contact customerservice@kidrobot.com for customizing options. Huck Gee is a San Francisco based artist well known in both the fine art and custom toy realm. His works have been exhibited in galleries worldwide and in 2007 his “Hello My Name Is” 8-inch Dunny was accepted into the permanent collection of the Museum of Modern Art in NYC. Available February 6 at Kidrobot stores and kidrobot.com. 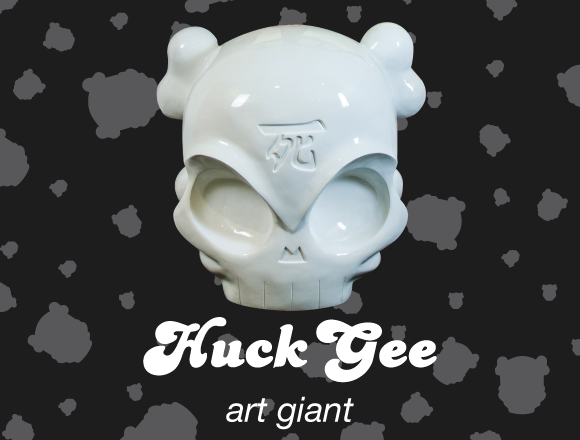 Huck Gee’s Fiberglass Skullhead in solid white retails for $4,999 US. Contact customerservice@kidrobot.com for potential customizing options. Priced on a case by case basis.